Males court females and once paired they will typically stay together throughout the breeding season. Males guard females during egg laying and incubation, and both share brooding for the first two weeks after hatching. A large stocky bird with a round body and small head. The head is bare and decorated with patches of red and blue skin. On top of the head is a dull yellow bony knob. The body plumage is grey-black and spangled with white. 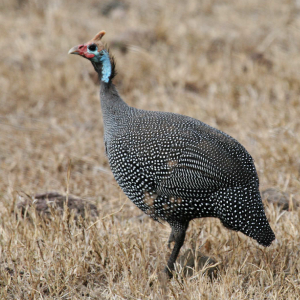 Helmeted guinea fowl are gregarious birds meaning they live and travel in flocks. Photo by Profberger at English Wikipedia [GFDL (http://www.gnu.org/copyleft/fdl.html), CC-BY-SA-3.0 (http://creativecommons.org/licenses/by-sa/3.0/) or CC BY 2.5 (https://creativecommons.org/licenses/by/2.5)], via Wikimedia Commons. Photo has been cropped.